Overall, another fantastic race by Kona Running Company. This was the last of their races in 2013 and they didn't disappoint. If you like chocolate, they had chocolate! A great start, course, finish as usual. A unique post race party with all the chocolate. 6,000 runners for the Inaugural race which is incredible! A bit of work needed on the post race party which is in the works by the race staff already. They continue to offer outstanding races and I'm already looking forward to running them next year. Registration is always very simple for races these days being everything is online. Kona is no exception to the rule. 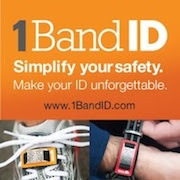 You could sign up online easily and/or you could also mail in your race packet information. Because I'm a Kona ambassador, I always mail in my information to the race director but I've used the same system, Hughesware, on tons of other races as well and it's very easy. Packet pickup was at their usual spot for their Plymouth races at the middle school near downtown Plymouth so it's always very easy to get in and out. Since I could not make it on Saturday for packet pickup, I asked my running buddy to pick up my packet. This is one thing that is really easy with Kona races. All you do is look up your friends number and ask for their packet. The race makes it very simple. Since I had enough time before the race on Sunday when I got there, I decided to go over to packet pickup anyway just to get some pictures of what was going on there. There was a small expo to buy things(although only a few people were set up as early as I got there - 6:30am). The packet pickup was in the normal Kona Running Company fashion as Liz, who runs packet pickup, was there working the packet pickup area and helping volunteers do what they needed to do. All you needed was your race bib number which was on the opposite wall of the packet pickup and the volunteers would get your packet. For this race, they sold out early, but the race was able to provide additional entries into the race at packet pickup. This meant you could sign up that day as well until they sold out again! Awesome if you still wanted to get into the race. They even offered late runners a $10 discounted entry without a shirt although I think with this race, the shirt was one of the main things people wanted to get. Since I didn't have to pick up my packet, I just took a few pictures and made my way to the start area which is only a few blocks from the school. I always suggest if you are not going to make the packet pickup the day before, plan to get to race day pickup early to avoid being stressed. Of course, I'm Mr. early and the race was still setting up the finish line when I got there. I got some pictures of the start area as I knew it was going to be super busy after the race. I also took the chance to use the restroom before it got too crowded. Per the race director, given the number of runners, the race did add more port-o-potties. The number of them has usually been fine but with the size of the race growing to 6,000, more were needed. The race director subsequently called me after the race to let me know they would be adding even more port-o-potties next year as well. A welcome improvement and a very easy problem to solve in future races. The race had all their medals set up and covered(since it was expected to rain). I always love getting a picture of all the race medals ready to go. It gets you so excited for the race. I always give Kona credit for other races now offering race medals. Whether it's true or not, I don't know but I think it is. I don't think there would be as many local races now offering medals had Kona not started it years back. 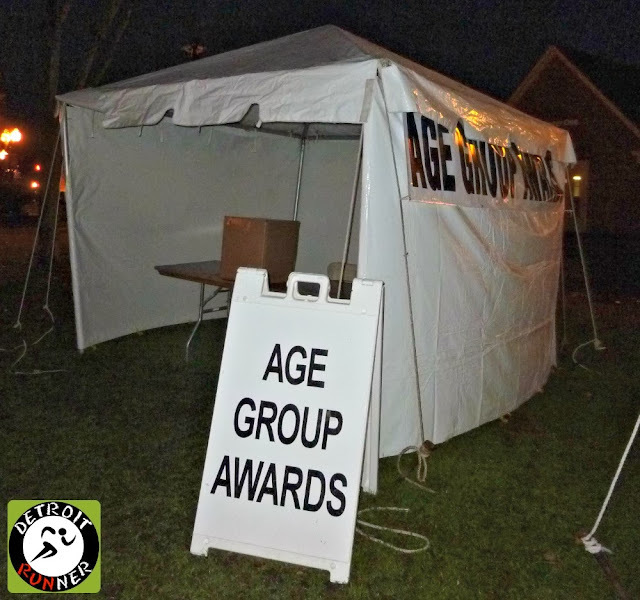 All their tents were set up for the costume contest, the age group awards(which I cannot seem to be fast enough to win for Kona races - darn! 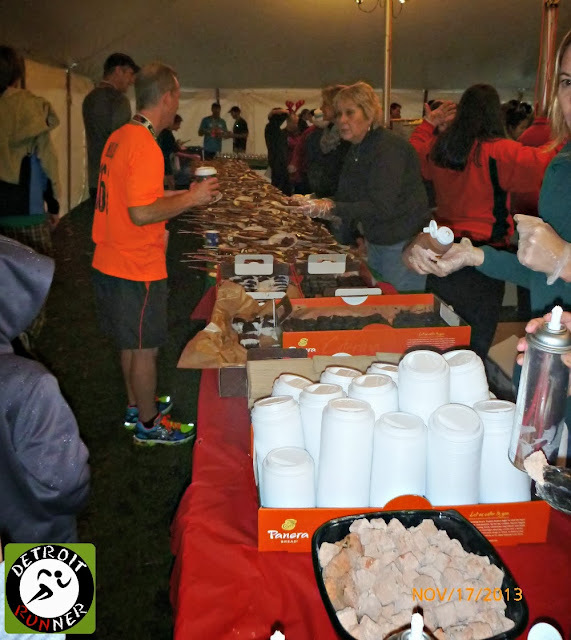 ), the food buffet aka chocolate paradise area(they don't call it that but I did), and the runner's warming tent. 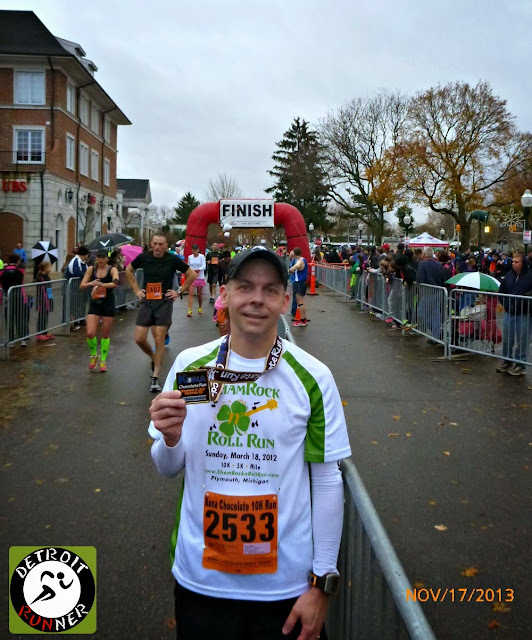 Since the weather was unbelievably warm for mid November(mid 50's), it was not really needed except that it did rain for part of the race. I was able to take cover in there after the race when it started raining so I was happy to see the tent there. I was able to get a quick picture with the Southeast Michigan Runners Group(SEMR) from Facebook before the start. It was nice to finally meet some of the people that I talk to online about running. If you have a Facebook account, you can join the group HERE. They have more members than I do Facebook likes!!! After that, we talked for a few minutes and Brittany, who follows my blog, even made it a point to come introduce herself, which was really nice. I love when runners come up to talk to me at races. It was now time to get in line for the race! Yay! As we got in line, the race had a band do a Christmas song and then did the National Anthem sung by Morgan Whitehead, the race director's daughter. As you can see, it's just getting light out! 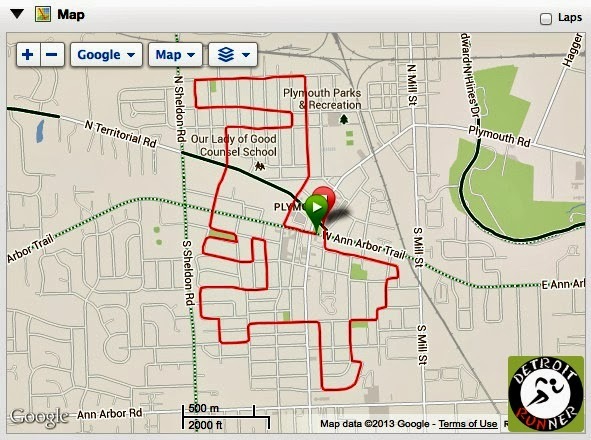 One of the good things about this race(at least in my opinion), is that this is a great course in the neighborhoods of Plymouth. It's also the same course as the ShamRocknRoll Run(now known as Kona St. Patrick's Day Run) and the Wicked Halloween Run. 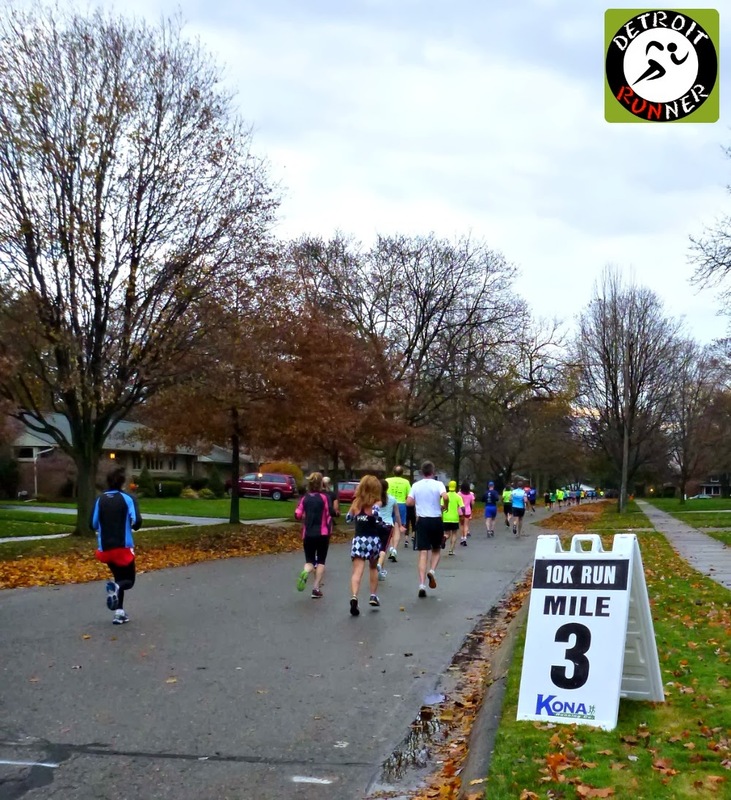 While some people don't care for the same course for three races, it does help you determine your fitness if you decide to do all three of these races in a year. You get to compare yourself. 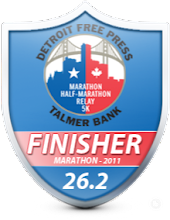 For example, this year, in March I ran the course in 48:26, October was 48:02 and this race was 47:48. Frankly, I didn't have a goal for today but it appears that I ran my best one today of the three! I got set up between the 48 and 45 minute pacers. Yes, the races offered pacers again for the 10k and 5k races - the only races I know that offer pacers for that distance. While I never not stop on the route to take pictures, it was such a cloudy day, I decided to stop at each mile marker only(you'll see the pictures came out better than when I was running). I didn't have any goal pace so I figured why not. That is why you see my paces dip down every so often. Fortunately we are running in the wide street so it does not get in the way of anyone running. 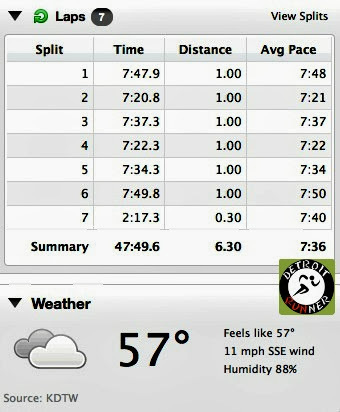 I kept my splits fairly consistent throughout except for the first and last mile, which were a bit slower. Overall, I felt pretty good the entire race. Of course, who couldn't feel good with temperatures in the mid 50's for November in Michigan? Fortunately, I was able to run about 4.5 miles of the race before it started to sprinkle and really it sprinkled to the end of the race. I was able to get finished, get a picture, get food and get in the warming tent before it started to rain again. Unfortunately some of the 10k runners and all of the 5k runners were not so lucky. Hey - the weather is the only thing the race can't control. As you can see, the roads were wet already since it was pouring overnight and just a couple hours before the race. I absolutely love running in downtown Plymouth even after so many Kona races here. By mile one, it was starting to get lighter out so at least I could get some halfway decent pictures on the course. I grabbed this picture below because 95% of the trees had no leaves and these were so nice to see out on the course in Mid November. 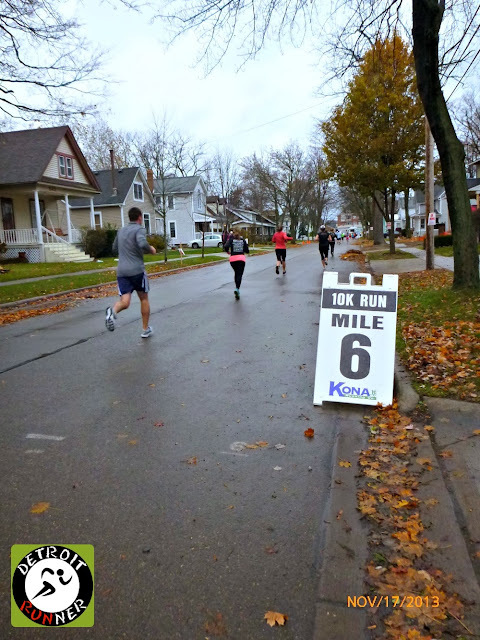 I know some runners had issues with leaves in the street but if you looks at the pictures above and below this, you'll see that this was not an issue as we had the entire street to run through. Let's face it - we run for fun, fitness and time but we don't do this for a living so a few leaves should not bother anyone. 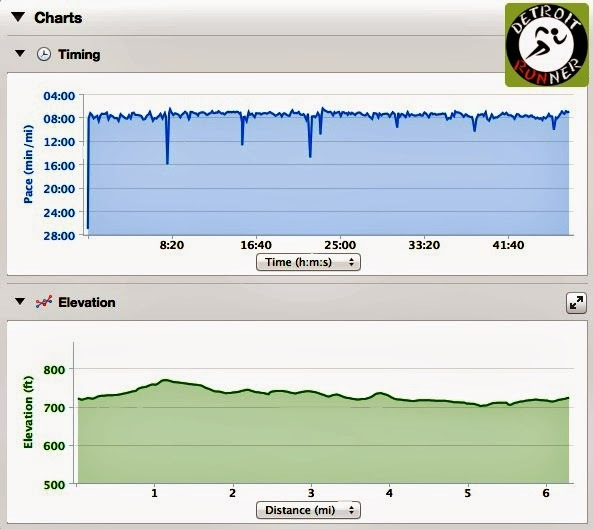 It certainly did not effect my time given I ran the course twice before this with no leaves and slower times. The police and volunteers were out in full force helping to control traffic. Of course, the police were stationed at bigger/main intersections and, as always, did a great job helping keep traffic clear for the runners. The volunteers also did a great job keeping runners going in the correct direction. Mile 3 - almost half way! We always pass this little park near the end that is so nice. It kind of reminds me of a park I lived near when growing up. We are in the home stretch now and headed back to downtown. I love all the different homes in a downtown area like Plymouth. It very much makes me feel like where I grew up in Birmingham. The end is one of the best parts because, typically when you get there, there are people cheering and more so if the 5k has not started yet. This will be a key factor in Kona's next race for me, finishing quickly, since I'll be running the Dublin Double in March which is the 10k run then the 5k run. The spectators line the finish line right by the farmers market area and the race always does an excellent job keeping people moving and keeping spectators off the course at the finish with fencing. 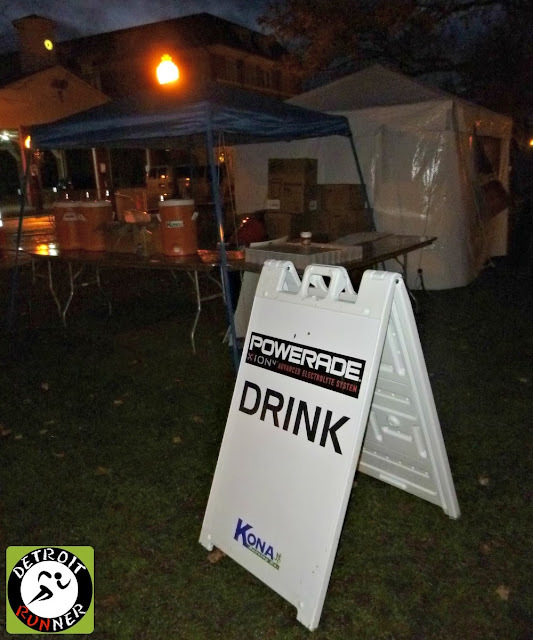 The aid stations at Kona are always well stocked with water as well as Powerade at the 3 mile mark for the 10k. The volunteers are usually cheering runners and having a good time as well as yelling out water or Powerade as you run by. I only stopped for the half way mark for a cup of water but there are plenty of aid stations for a 10k course. There is also one port-o-potty out on the course. Something I've never seen in a 10k except for Kona races. As I've said in the past, the downtown Plymouth area for a race is an awesome venue. 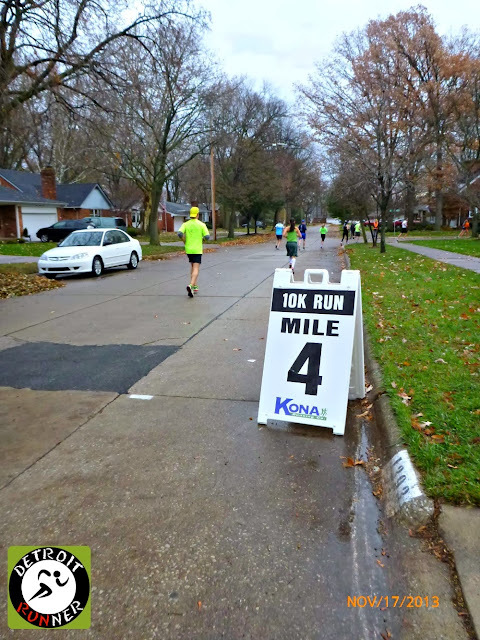 I love finishing right downtown, and having Kellogg Park right there makes for a perfect start and finish area. It's also nice because parking is so close to the finish line. The only issue is going to be the size of the event is likely to get capped at a certain number at some point in the future, so next year, remember to sign up sooner rather than later. Finish area - very busy! As I mentioned earlier, there was a Powerade tent for Powerade and water. This was a great idea as many runners want water right after the race. If you had to wait for it in the food buffet tent, people might not be very happy. The people at Kona are always thinking ahead for the runners! Of course, this is a chocolate run and so there was chocolate - lots of chocolate - actually TONS of chocolate. Runners had tickets on their bib to get into the tent. 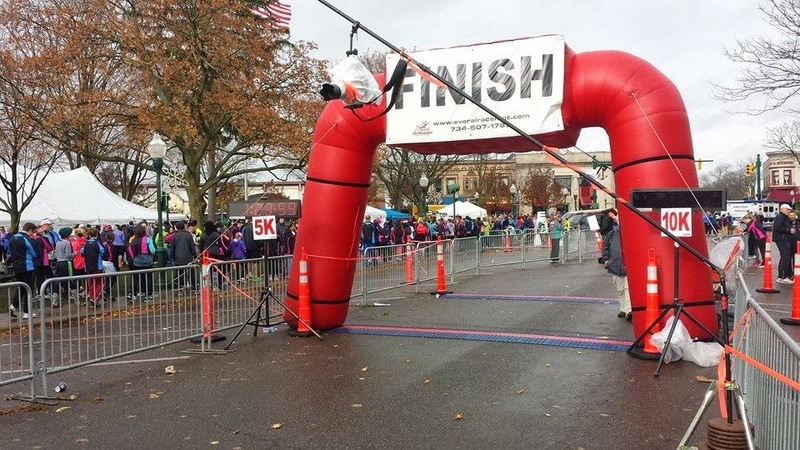 While this likely slowed down the line slightly, keep in mind that it was necessary to keep specators out of the tent since this was for runners only. As you entered the tent, they started with Hot Chocolate(yeah, I know, remember that the race can't control the weather) and it was pretty warm for this but I'm sure future years we will be happy to have it. After you got your hot chocolate, they had all kinds of toppings to put in it. Whipped cream, caramel, etc. Very nice indeed! 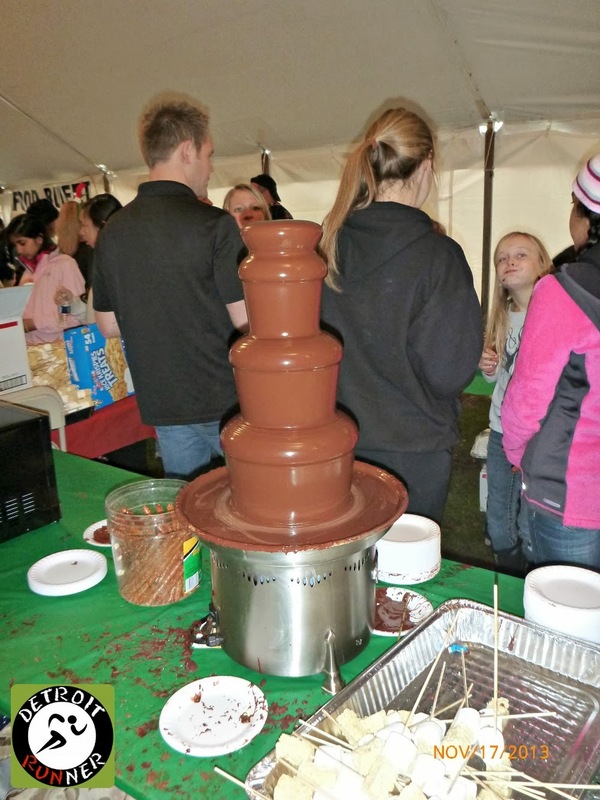 They had two chocolate fountains and frankly, I was concerned how they were going to handle this. I figured with these running, there was going to be a huge backup waiting for people to dip their items in it. Fortunately, the race put the fountains in the middle of the food buffet so the volunteers could get the items dipped ahead of time. This made it much, much easier and faster to keep the food line moving. The race had two lines in the tent as well. 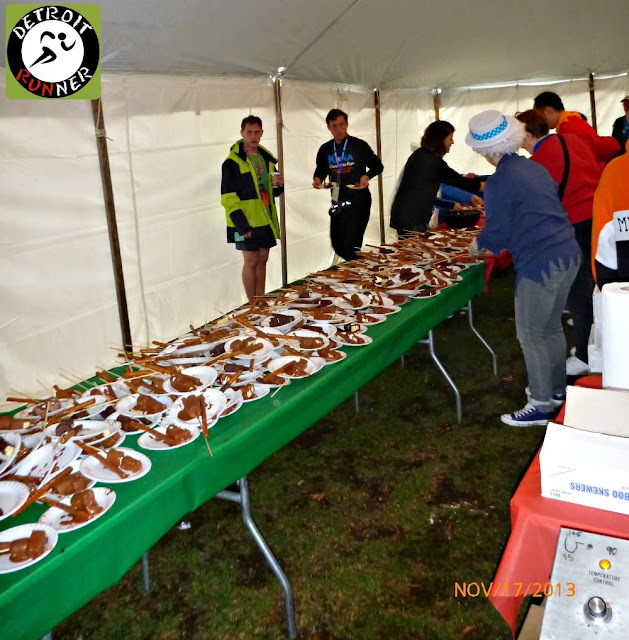 The volunteers took and covered a pretzel stick, a marshmallow, and a rice crispy treat with the chocolate from the fountain and laid them down for runners to grab. In addition, the race had brownies and water for the runners too. Noodles and Company was also giving out half cookies like they have at other Kona races and these cookies are really good! I think it was quite organized! Of course, with 6,000 runners for the inaugural race, the line for the chocolate backed up quite a bit after I was through it(20-40 minute wait from some runners I talked with) Unfortunately, it just takes time to get that many people through the line, but the line does keep moving. I think the biggest issue for many was knowing where the line ended to get in it. Realizing that things need to be addressed in this area, Alan Whitehead, the race director, contacted me the day after the race to discuss the large wait at the chocolate tent and wanted to address the concerns some runners may have had with it and how they are already starting to improve the process. The first solution is they have already created a Kona task force to solve the challenges that need to be corrected for 2014. Some of the initial solutions and plans are to have two tents with four lines to the chocolate buffets. 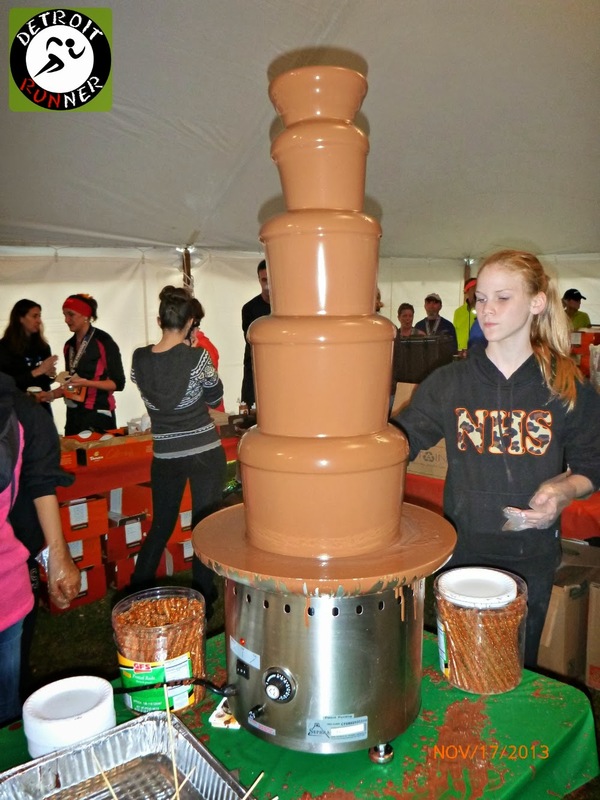 In addition, they are going to plan a more efficient chocolate buffet serving operation and stream line the setup. They are planning for barricades from the finish line corral to the tent entrances to prevent any confusion. They will also offer water within the barricaded finish line area. They are also discussing adding another start wave to each of the 10k and 5k events to spread out the amount of finishers into the park and to the buffet. They are also looking to widen the finish area after the timing mats to spread out and double the finish width and area. These are just some of the ideas the task force is already talking about for next years improvements to the race. I have to say that I'm really impressed. Not only are they addressing the concerns but they are already starting a year in advance. To me, this shows that the organization is genuinely concerned with what runners think and they want everyone to have a great time at their races. I also appreciate that the race director took the time to contact me after the race to explain the issues. This is one of the reasons why I love being involved in the Kona races. They really do care what runners think. Unfortunately, it started to rain as some people were waiting in line but again - nothing the race could have done about that. Actually, when I left the warming tent to head home, the rain had stopped and the sun was starting to come out! Frankly, the weather was much better than what was forecasted. You also received an embroidered 1/4 zip tech race shirt. This thing is REALLY nice. 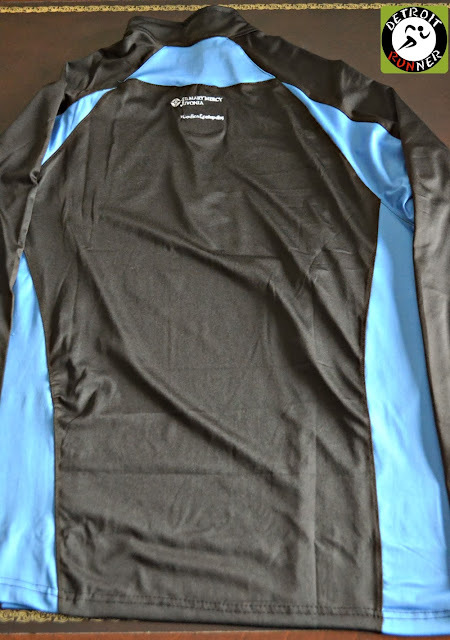 This is the nicest shirt I've received from Kona Running Company and from any race I've done for that matter. The race offered both men's(in blue) and women's(in pink) which was a nice touch. Every runner received this shirt whether you did the 10k, 5k or the one mile race. If you did the 10k race, you also received the Inaugural Kona Chocolate Run medal. As I've always said, Kona does a great job when it comes to the medals. They know their bling. This one is a simple design and it's huge! It's larger than some of my marathon medals. I also like the great ribbon design. The organization is always excellent at the Kona Running Company races. I've always used them as the gold standard for race organization which is probably why I'm sometimes disappointed at other races. The Kona organization just knows how to do things right. They are always thinking ahead to make sure things run smoothly and/or addressing any issues straight on to satisfy their customers. 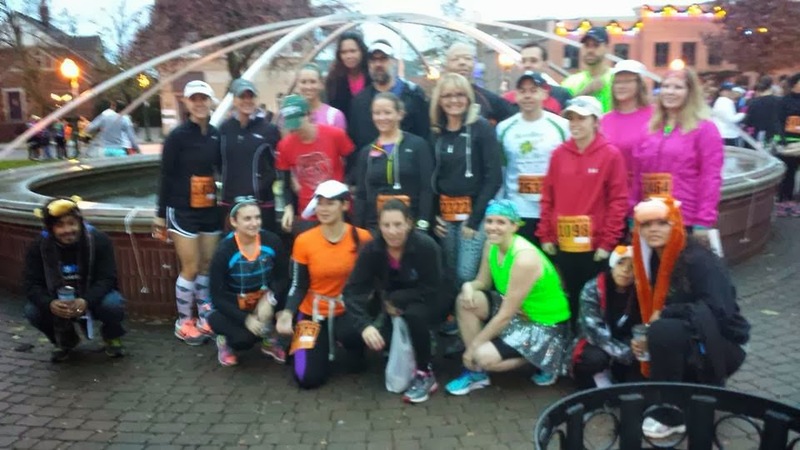 Let's be honest here, sometimes runners can be a whiny bunch(no really! me included), but I don't hear any of that at Kona races(except for runners who have no right to). The organization continues to excel at each race and they are always open to suggestion to find ways to do things even better the next time. This is why they set up the task force I mentioned earlier. They are always proactive, listen to the runners, and it's what makes them a great organization. Overall, in my opinion, it was another successful race for the Kona Running Company organization. 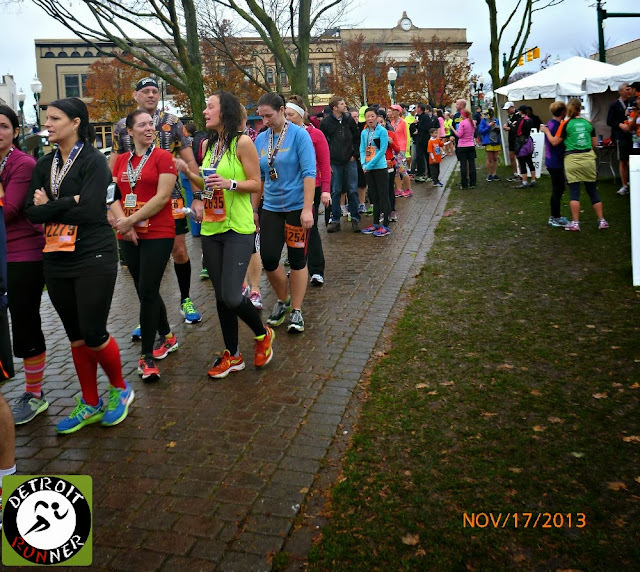 From the registration and packet pickup to the start, course layout and finish areas. The medals and shirts were incredible for this race. I'm always impressed with their new ideas - which is hard to do with all the races out there these days. A chocolate run is one that has been long waited for in the area and now we have it thanks to Kona Running Company. With the exception of the hiccup on the food line which is expected to be corrected next year, they have added another great race option. It should go without saying but I will be back! From the looks of it, Kona will continue to impress us next year as well with a new race(Novi Half Marathon) and some new race features at their races. I, for one, am already counting the days(less than 4 months) to run the Kona St. Patrick's Day Run in March. 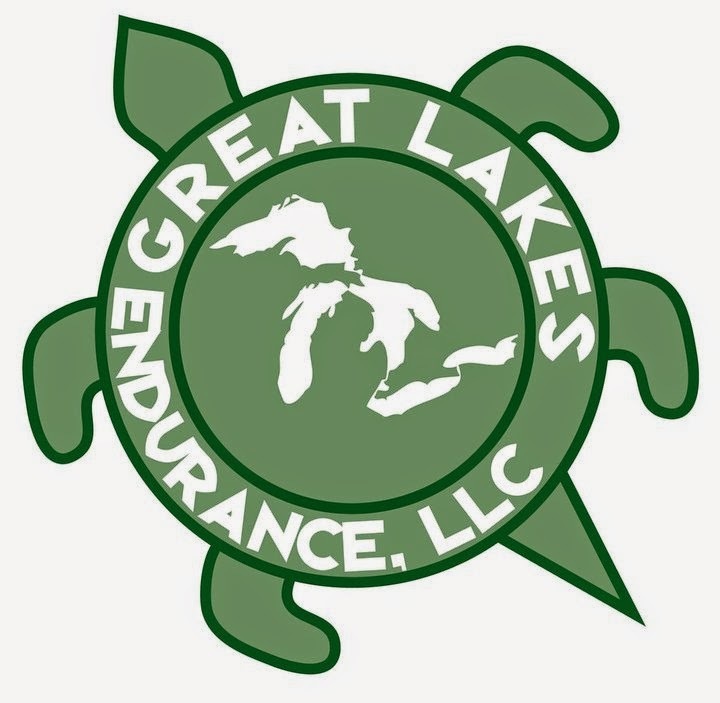 Check out their website HERE for more details on next years races. You're going to want to get in for the Kona Grand Slam series next year and earn yourself an extra medal. Note: As a race ambassador for Kona Running Company, I receive a complimentary entry into their races in exchange for an honest review of the race. All opinions on this post are my own and I'm not required to give a particular opinion on the race. My expectation is that they use my reviews to help continue to improve their races each year. Nice job improving your times through the year and nice collection of medals from these Kona races. It's good to know that they acknowledged areas that need improvement and they're already working on it. All of that chocolate sure looks good! Thanks Janet and yes, the chocolate was good and a nice change from a bagel but, frankly, I love the bagels! You know there will be more chances! Hah. Nice report. I will say if you get there earlier, a spot behind the farmers market is perfect. Also glad they see need for improvements, but you ran a much different race than I did. Runners who finish early have all the advantages of total access to post race food and short lines. Finish towards the end of the pack and it's a different story. I will still register for next years runs to give it another chance, but it's so impressive to finish a race and not have to face endless lines for what was promised as part of the race. Runners at the back of the pack still count! All the runners count. I'm lucky to be near the front so I don't typically experience crowds at the end of races. You will see improvements next year for sure. I was a 65 minute pacer so I was about 20 minutes after you. The lines were very long and wound around the park but they really did move along fast. I was surprised how fast the line moved. The chocolate on my plate was hardened to the plate so I couldn't just pick up the sticks so I ended up taking it home with me and ate it later. I really enjoyed pacing and helping people reach their goals. Thanks for volunteering again! I agree that the lines tend to move fast and with their improvements it will be even better. Kona always improves things even when you didn't think something needed improvement. My husband and I always finish at the back of the pack, and we have a ball! Amazing volunteers, well managed course, way cool medals.... Kona really has their act together! We won't miss one of their events, and can't wait to earn the Grand Slam Medal next year! I think most feel the same way. I can't wait for the Grand Slam either! Certainly a great event! Awesome review and run! I love chocolate! Why don't we have a chocolate run here? :( Your pacing was very consistent. Well done! All of the Kona races sound awesome and make me sad that I don't live close enough to participate! It's really nice to see them start to improve on issues already. There are many races where I get the feeling than any criticism and complaints fall on deaf ears. Nice to see Kona being so responsive!